I am working on a Twitter Client right now. 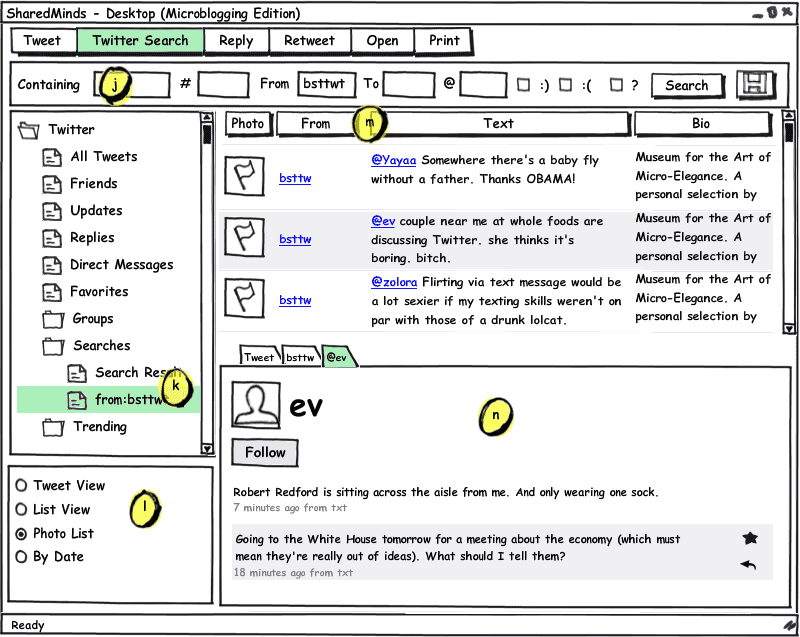 But I am not working on some Twitter Client – I am working on the ULTIMATE Twitter Client! Right? Well sort of… however we need to define what “ULTIMATE” means in this context ;-) Ask a thousand people and you will probably get thousands different answers. For example here is Guy Kawasaki’s wish list – which by the way is pretty good! The main menu can be used to show / hide the Tweet view and Twitter Search. It allows interacting with Tweet commands like Reply, Retweet etc. It should be possible to select one account or multiple accounts for “cross account tweeting”. I somehow can’t write without spell checking anymore… So spell checking support will be there right from the beginning! Clicking on “Shorten URLs” will shorten the Tweet URLs all at once. Use the navigation pane to … well … to navigate! You can view Tweets in different ways: Tweet View, List View, Photo List etc. URLs, #hashtags and usernames should be rendered as clickable hyperlinks. It should be possible to sort and filter by all visible columns. The tweet preview pane can be either shown on the right, bottom or it can be turned off. For each URL, #hashtag and username a tab will be added automaticcally and the referenced web page, picture, video, twitter search or user profile is just one click away and can be viewed right there. Pretty cool! After saving your search query it will get a default name and appear as a new node under the search folder. From there you can rename it, change it’s icon or put it into a category folder of your choice. 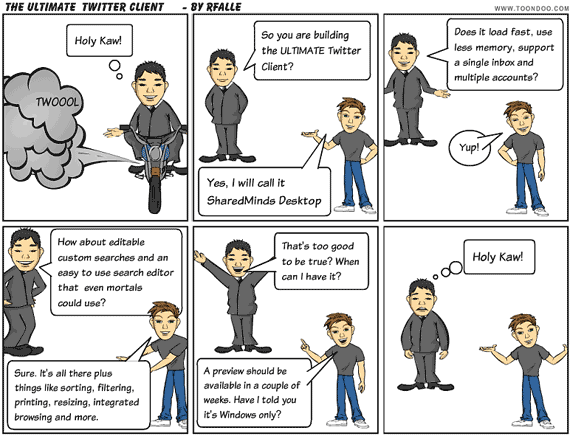 Twitter Search can be used even without a Twitter account. So there is no account filter for twitter searches. By selecting List View or Photo List you will be able to customize the view in different ways: apply groupings, filters and choose the columns you like to display. For example it will be possible to choose from a number of different columns: Name, Text, Date, Bio, Friends Count, Followers Count etc. 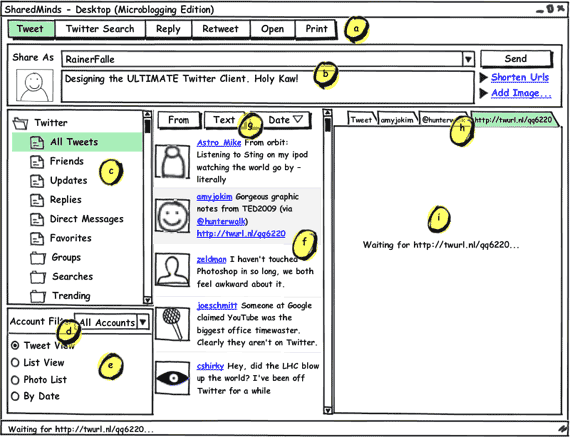 How does your Ultimate Twitter Client look like? Which features would you like to see? @Punit Pandey: Thank you for the feedback! The scrolling performance was a little bit slow so far. This has been improved. You should see a significant performance improvement in the latest version. So far, I liked your ultimate twitter desktop. I feel it is a little slow. I don’t know whether I am the only one saying so. Anyways, it is a great work. Keep it up. Excellent!!!! Looking forward to use your ULTIMATE Twitter Client. By the way how did you created that nice cartoon script?